RIFLE — When Larry Velasquez planted his rose bushes this year, it wasn’t just because they were beautiful. Velasquez planted the roses in honor of his wife, Barbara, who passed away last month at the Colorado Veterans Home here. The Velasquezes had lived in Battlement Mesa for 26 years before recently moving to the Colorado Veterans Home because Barbara was suffering from dementia. 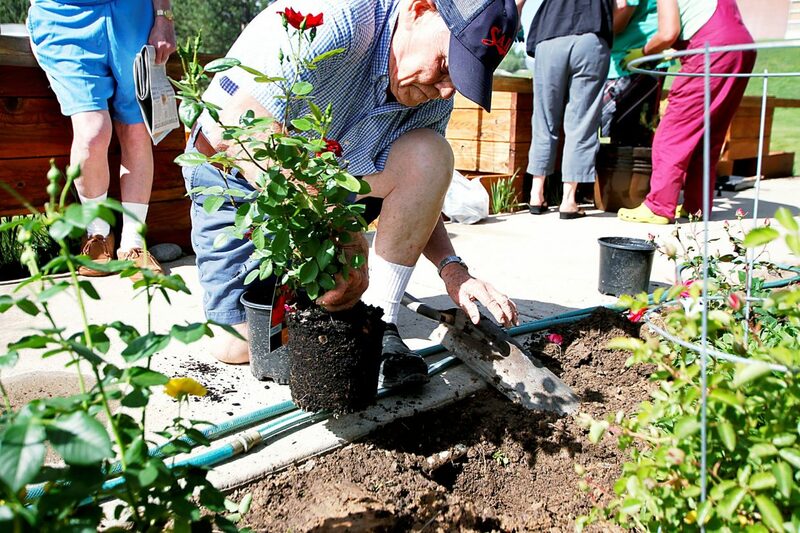 Marilee Rippy, a volunteer and founding board member of the Community Gardens of Glenwood Springs, who works with a lot of seniors in planting gardens and harvesting them, said gardening is good for seniors, especially those suffering from the loss of a loved one. Rippy noted that seniors who have never gardened before might not be as apt to try it for the first time, but those who have will likely enjoy it. Rippy said the Velasquezes’ home in Battlement Mesa was beautiful and always immaculate with lots of flowers and plants in and around it. And even though they may not be living in their homes anymore, the seniors still look forward to working in the community gardens, Rippy said. And just getting out and moving around puts them in a better frame of mind. Velasquez said he had a hard time finding his rose bushes, but eventually purchased 27 plants of red, pink and yellow roses. He contemplated where he was going to place them on the plot outside of the nursing home, before he gingerly got down on one knee and began planting.